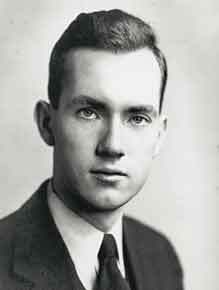 Microwave physicist Charles H. Townes conceived of the maser (an acronym for microwave amplification by stimulated emission of radiation) in 1951, and designed and tested the first maser two years later. He said later that the idea of converting molecular vibrations into radiation came to him out of the blue as he was sitting on a bench in a public park. With his brother-in-law, physicist Arthur L. Schawlow, he began working on the laser (also an acronym, for light amplification by stimulated emission of radiation) in 1957, and formally proposed that the principles of the maser could be expanded into the optical realm with lasers. In 1960 Townes and Schawlow obtained a patent for the laser and explained their idea in an article in Physics Review, which inspired a reader of the journal, Theodore Maiman, to build the first working laser. In 1964 Townes won the Nobel Prize for Physics, shared with Nikolay G. Basov and Aleksandr M. Prokhorov of the Soviet Union, who conducted similar work independently. Townes was also known for his work on the Autler-Townes effect, Brillouin scattering, and self-trapping of light. He retired in 1986, but continued to maintain an office at the graduate school in astrophysics at the University of California at Berkeley until his death in 2015.